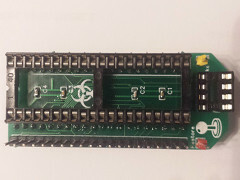 Jeroen developed a new device for the Commodore C64. With this device it is possible to swap the joystick ports of the C64. The Joyswap is build inside the C64c and swaps the joystick ports when you hold down the Restore key for 3 seconds. It is also possible to use the device as a Kernal switcher.